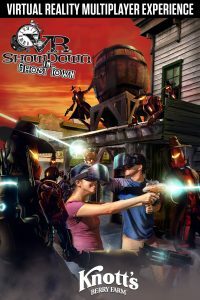 March 8, 2017 – Knott’s Berry Farm, its parent company Cedar Fair Entertainment and VRstudios announced details about “VR Showdown in Ghost Town”, the park’s new-for-2017 free-roaming, multi-player Virtual Reality experience that will be available to guests at an introductory price of $6, in addition to park admission. The interactive VR attraction will have guests embark on a time travel adventure, which will transport them to a futuristic version of Knott’s western town of Calico. Players will be met by robotic creations and embark on a daring mission with other groups of players to defend the town. Armed with state-of-the-art wireless virtual reality headsets and futuristic blasters, multiple players will compete against one another for the highest score, as part of this immersive adventure, while striving toward shared team goals. At the end of the VR competition, guests will be able to view and compare scores with their fellow opponents. Read more about VR Showdown in Ghost Town in our Forum discussion. This entry was posted in News and tagged Anaheim, Buena Park, Calico, California, Knott's Berry Farm, Virtual Reality, VR Showdown in Ghost Town. Bookmark the permalink.